David Manley Weixel, age 71, died on April 7th, 2019 at Juniper Village in State College. David was born in Bellefonte, on Dec. 22, 1947 as the second son of Dr. John Gerard Weixel and Carolyn Chamberlin Curtin Weixel. On Jan. 30, 1982 he married Sharon Inch Roush who survives. He graduated from Bellefonte High School in 1965, The Pennsylvania State University in 1970 with a B.S. in Finance, and the Dickinson School of Law in Carlisle, Pa. in 1974 with a Doctor of Laws degree. David was admitted to the Bar of the Supreme Court of Pennsylvania in 1974. David worked in law-related activities throughout his life. First as a clerk in the Law Office Love & Wilkinson, predecessor law firm to McQuaide Blasko Law Offices, while he was an undergraduate at Penn State; next after law school graduation as a judicial clerk for Hon. 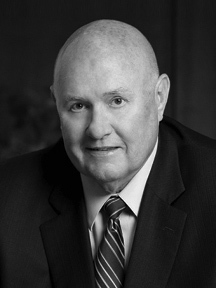 Roy Wilkinson, Jr. on the Commonwealth Court of Pennsylvania; then as a practicing attorney for the remainder of his life in the McQuaide Blasko Law Offices, initially in the firm’s Lock Haven office and then in the State College office. He spent more than 50 years at McQuaide Blasko, going from a clerk to senior partner/shareholder. As a practicing attorney in Lock Haven David also served as Assistant District Attorney in the late 1970’s and as Special Prosecutor in various Court-assigned criminal cases. After moving the State College office of McQuaide Blasko he concentrated his law practice on commercial real estate. Since 1986, while at McQuaide Blasko was privileged to represent his alma mater, The Pennsylvania State University, in hundreds of real estate purchases, sales and gifts, along with other land-related issues throughout the state. David served as a board member and later President of the Community Nursing Service of Clinton County and was a board member of the Clinton County SPCA. He was a council member of the Real Estate, Probate and Trust Section of the Pennsylvania Bar Association. He was a member of the Clinton County, Centre County, Pennsylvania and American Bar Associations. David had a life-long love of golf. He played competitively in his younger years, and followed golf throughout his entire life. He won the Club Championship at Clinton Country Club in 1981. Through his children he was introduced to his second sports love, soccer. In addition to becoming a FIFA licensed coach and referee, he was the Regional Coordinator for Soccer in the Nittany Region for the Keystone State Games. He diligently followed soccer and was especially a fan of the United States Women’s National Team, marching with the American Outlaws when the Women won the World Cup in Vancouver. He also enjoyed woodworking and driving his Camaro. He served as an enlisted soldier in the Pennsylvania Army National Guard during the early 1970’s where he performed such diverse military specialties as ground surveillance radar operator, armored recon scout, red-eye missile gunner and court reporter. In addition to his beloved wife, Sharon, he is survived by three daughters: step-daughter, Amy Roush (John) Barton, of York, daughter, Beth (Angie Grove) Weixel, of Hagerstown Maryland; and daughter, Erin (Josef) Oggier, of Manheim. He was especially proud of his grandchildren, Callen Oggier, Alexis, Jacob and Dylan Barton. He is also survived by a brother John Weixel of Wexford Pa.
Services will be at the convenience of the family. Memorial contributions can be made to the Clinton County SPCA. Arrangements entrusted to the Dean K.Wetzler, Jr. Funeral Home, 320 Main St., Mill Hall, Pa. Online condolences may be sent at www.wetzlerfuneralhome.org.